In the tricky sea state of chop and and a counter swell thrown up by a typhoon threatening the track off Fujian’s Pingtan Island, former world champion, Russia’s Elena Kalinina, finished the day mid-way down order racing against a strong field of men. 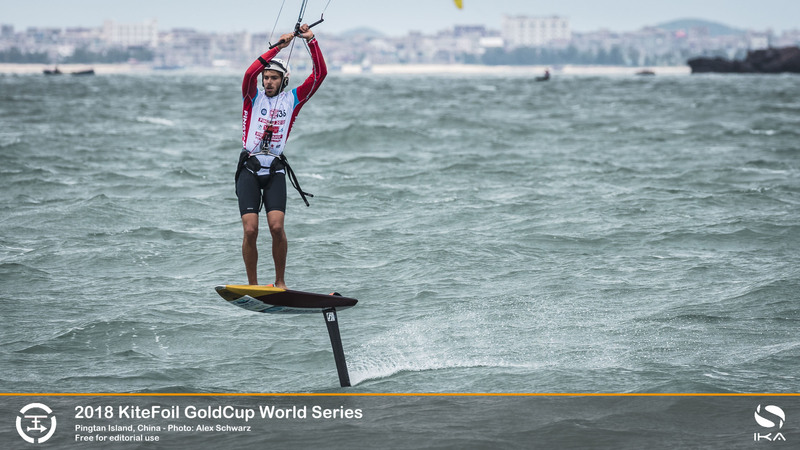 With the small group of women, she is competing in the 27-strong fleet from 16 nations battling on the second of the four-stop World Series tour that will eventually crown the IKA KiteFoil World Champion. 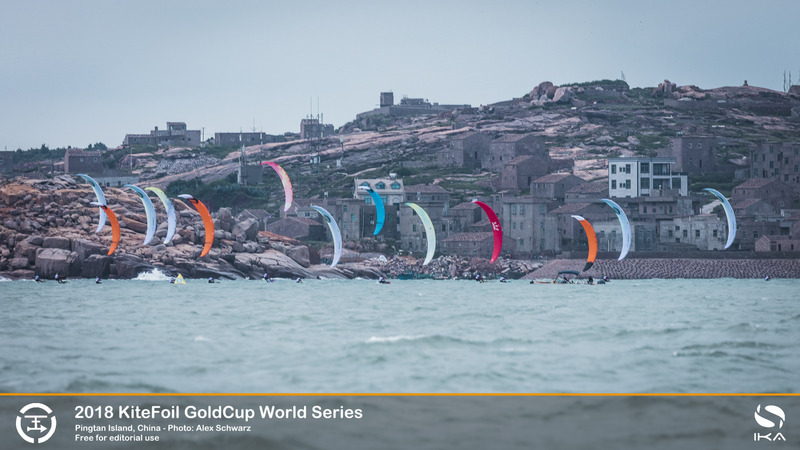 In Pingtan the kitefoil racers are fighting for a share of the $40,000 prize money, with the World Series stop the centre-piece of the 2018 Pingtan International Kitesurfing Festival. It is the seventh successive year that Pingtan has hosted a major international kiteboarding competition. The spot’s appeal is highlighted by the big local field among the 70 athletes competing in the Chinese National Championships in TT:R course racing, with three races completed on day two. 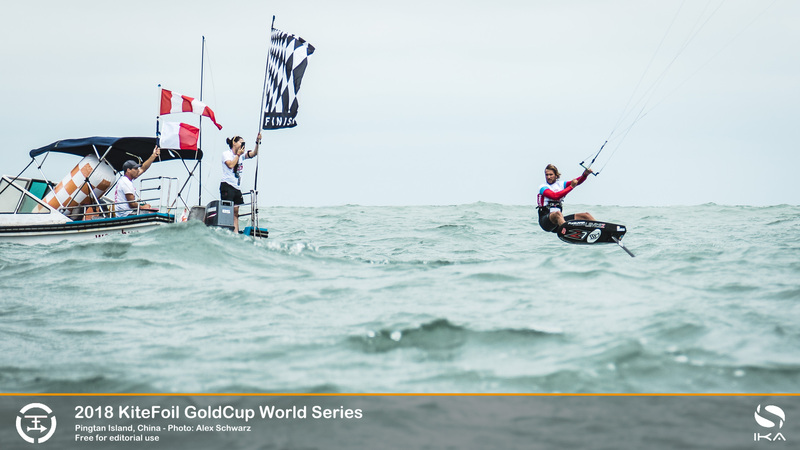 On day one of competition it proved impossible to get any races away thanks to the high winds and big seas that prompted safety concerns for the athletes. But day two saw the winds abate to what most of the racers deemed a perfect 14kts to 18kts under low grey skies. France’s Axel Mazella, nursing an ankle ligament injury, could not push as hard as he wished in the fresh conditions that he would normally regard as ideal. With his taped ankle, he suffered a big crash when he missed a gybe in the day’s third race while in third approaching the finish. But fellow countryman Théo de Ramecourt had more luck grabbing a brace of second spots that gave him a comfortable third overall, leaving him pleased with his outing on the windward-leeward East China Sea course.